The F30 Series of linear LED fixtures were designed as an LED replacement for the popular Resolux 700 Series low voltage fluorescent fixtures. 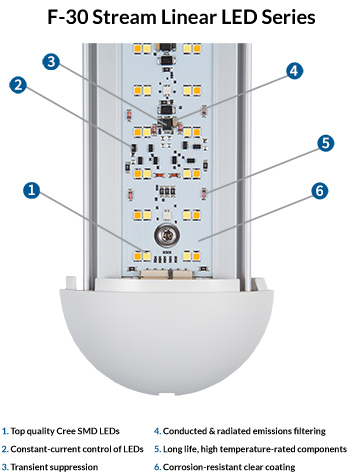 They deliver higher lumen output and with greater efficiency than their fluorescent predecessors. Choose from four sizes (15" through 49" lengths). Models come in either 12VDC or 24VDC, with or without a switch, and any of them may be dimmed using common PWM digital dimmers such as the Imtra Intervolt dimmer combined with a remote single throw momentary switch. Depending on the application, you may choose from traditional "warm-white" illumination or a cool-white. Some models are even available with switchable warm/cool output.